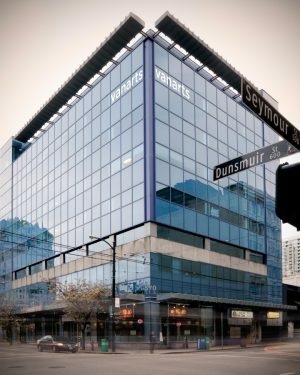 The VanArts campus commands the top four floors of a modern office building in central downtown Vancouver, with over 31,000 square feet. From the top floor you will be able to enjoy a panoramic view of the North Shore Mountains, Burrard Inlet and the surrounding urban landscape. We are conveniently located directly across the street from the SkyTrain station, parking and bus stations. Moments away are the boutiques of bustling Robson Street, the Vancouver Art Gallery, historic Chinatown and Gastown, the Vancouver Public Library, fashionable Yaletown and countless theatres, clubs, restaurants and shops. 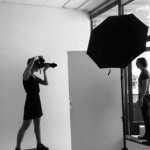 Our 8th floor features a 2600 square foot photography studio and a 35 seat theatre. 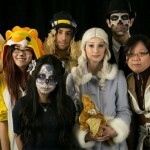 Though primarily used by the Photography department, all students and departments have access to our studio, and it is often used by students from the Visual Effects and Acting programs. VanArts’ 7th floor Administrative offices also houses the Bill Matthews Library. Featuring over 700 books donated by founding VanArts advisory member and former Manager of Artists’ Development at Walt Disney Studios. 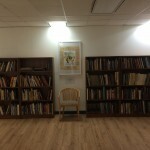 We are proud to have Bill’s collection of books on display. It’s a short and intense year at VanArts, and we try to break things up on occasion with student mixers and holiday celebrations. In addition to that, all of our departments strive to bring in special guests from their respective industries.